In case you are wondering why I have been a little quiet around here, I had a little accident and had to have stitches in my hand which has made it really hard to type! I am SO happy to be getting the stitches removed tomorrow, and to finally be sharing some fun projects with you this week! In the meantime, I have such a treat of gorgeous eye candy for you today! 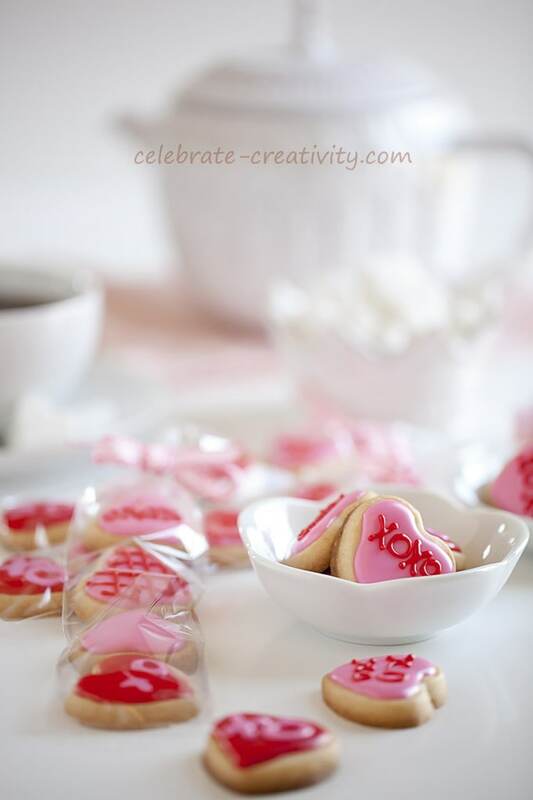 I am so thrilled that Lisa is here to share one of her beautiful ideas for Valentine’s day! I hope you visit her blog, Celebrate Creativity, to see her amazing projects! Greetings everyone, Lisa Tutman-Oglesby here. I’m thrilled to be part of this wonderful, creative team. It’s going to be a lot of fun and I’m looking forward to getting to know you over the next year through our shared love of home and creativity. 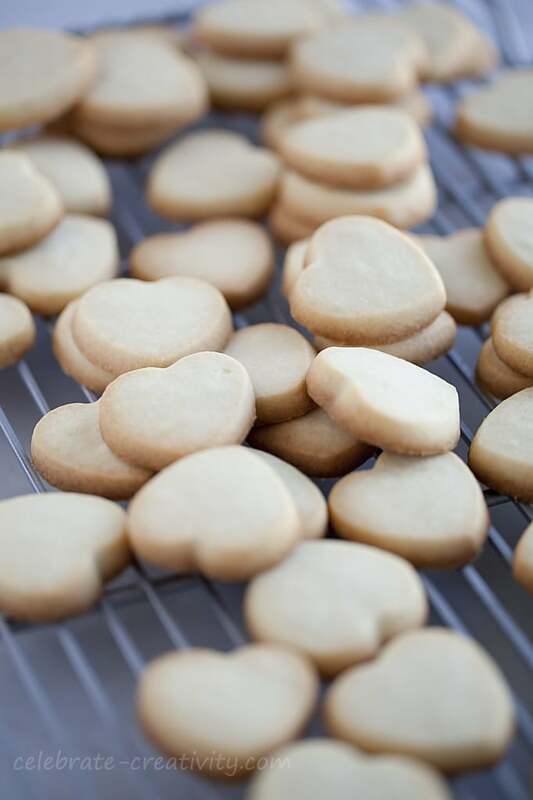 I’m kicking off my first-ever contribution to Ella Claire with a look at sugar cookie mini bites… just in time for Valentine’s Day… from my heart to yours. 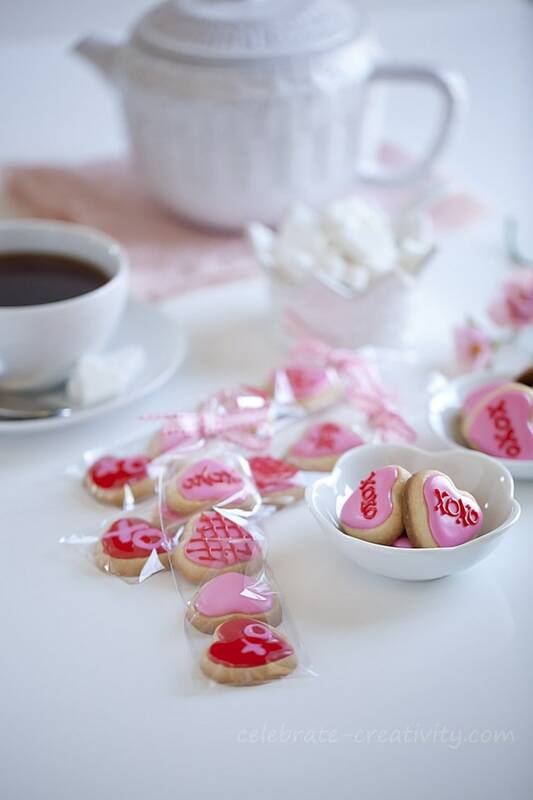 With Valentine’s Day right around the corner, you may already be thinking about homemade treats to bake, eat and gift. You’ll love these mini bites which are just as fun to whip up as they are to package up for friends and loved ones. 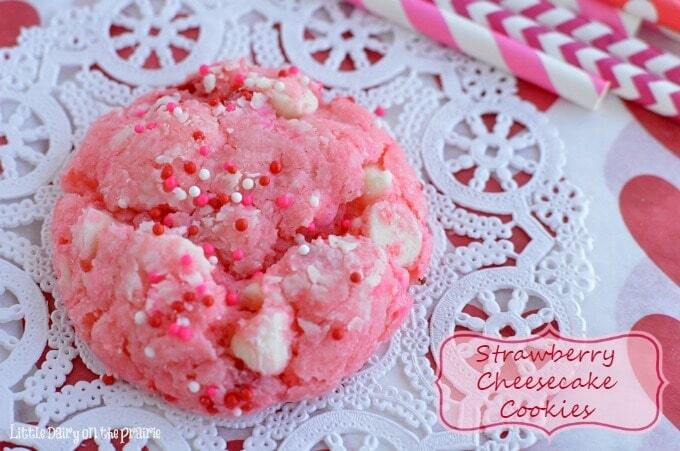 I have a few tips you can use with your favorite sugar cookie recipe. 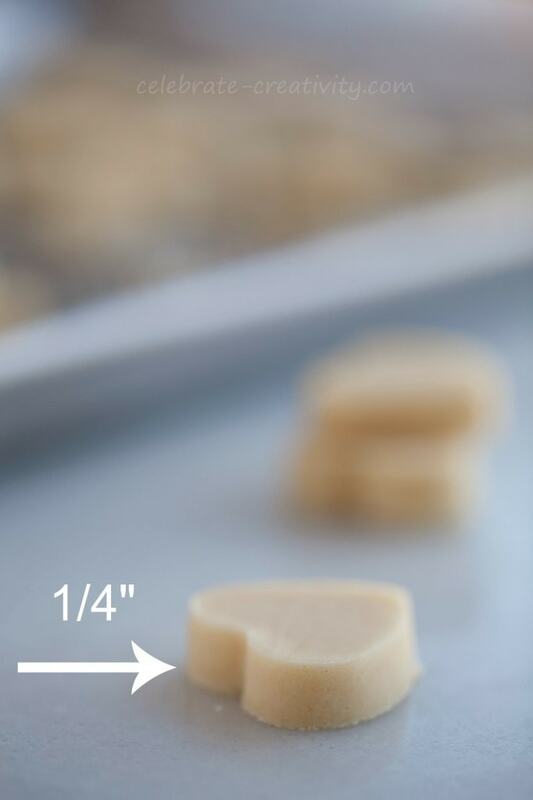 When preparing cookie dough, rather than shaping it in an oval and refrigerating it… roll it out between two pieces of wax paper as if you were going to cut the cookies right away. Then, place the rolled dough on a tray and freeze it for about 10 minutes. Remove from freezer, cut the cookies and then return them to the freezer for another 5 minutes. Then, pop the cookie-filled tray right into the oven from the freezer. See how thick and firm this cut dough looks? That’s because I rolled my dough to about a 1/4-inch thickness. The thicker, frozen dough will go a long way toward preventing the dough from sticking to the cookie cutter. 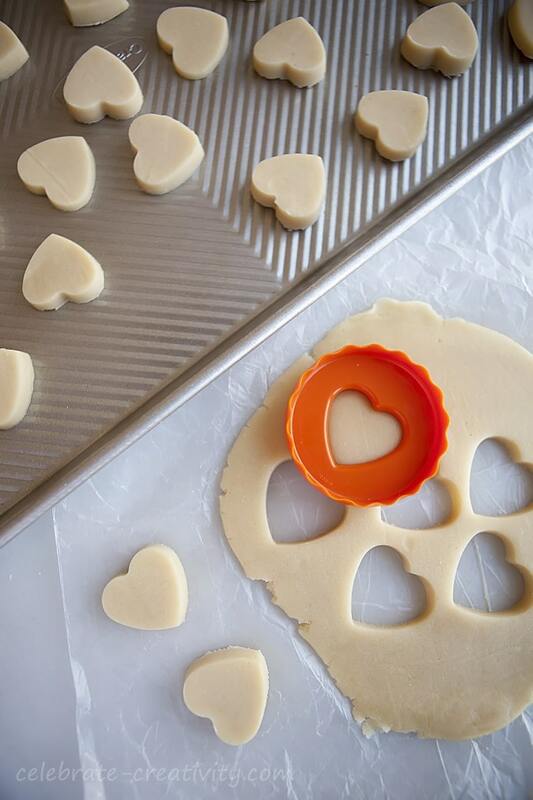 This is especially helpful when using narrow, detailed or intricately designed cookie cutters that have a tendency to stick to dough and run your cookie shape. It drives me crazy when my cookies spread too much in the oven. Freezing the dough seems to help my cookies maintain their shape in the oven. I also avoid using baking powder in the cookie recipe which definitely makes cookies spread. Don’t worry, your cookies won’t suffer if you skip the powder. OK, let’s decorate. First, tint your royal icing. I like to use plastic, disposable sandwich bags when icing my cookies the smaller bag makes maneuvering around the cookie so much easier. It’s cheaper than buying decorator bags too and you’ll likely always have sandwich bags on hand. Gently dispense the icing around the cookie edge, filling in the cookie space with more icing as you go. Use the metal tip to smooth out the icing at the same time you’re squeezing it out. Once the cookie is covered, gently tap the cookie on the counter to release any air bubbles. Another benefit of the thicker cookie is that it won’t break as easily when tapping out the bubbles. 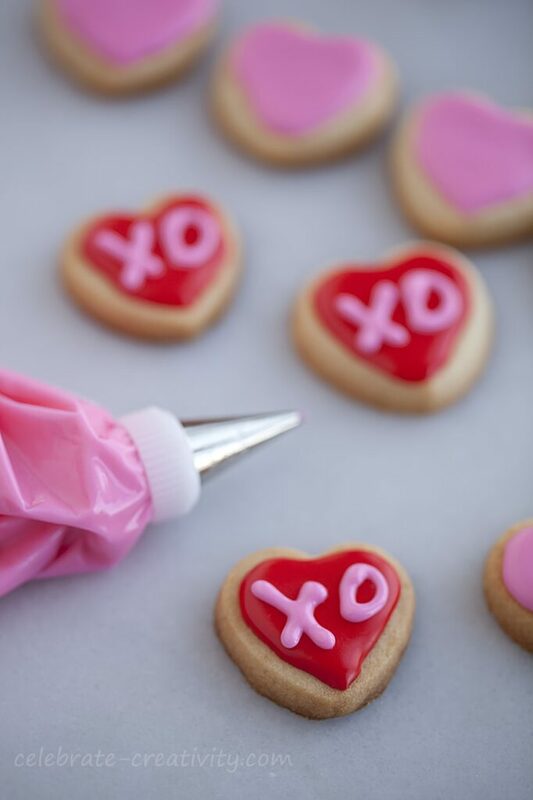 Wait until the icing is completely dry before adding the x’s and o’s or any other sweet messages. 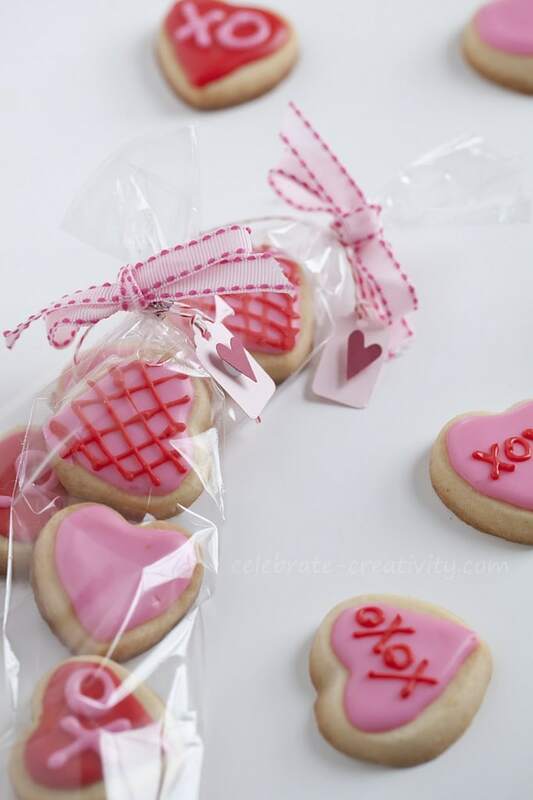 I think these would make cute little gifts to friends and loved ones as Valentine’s Day approaches and if you plan to gift some of these bite-size goodies, consider packaging them in a cute way. 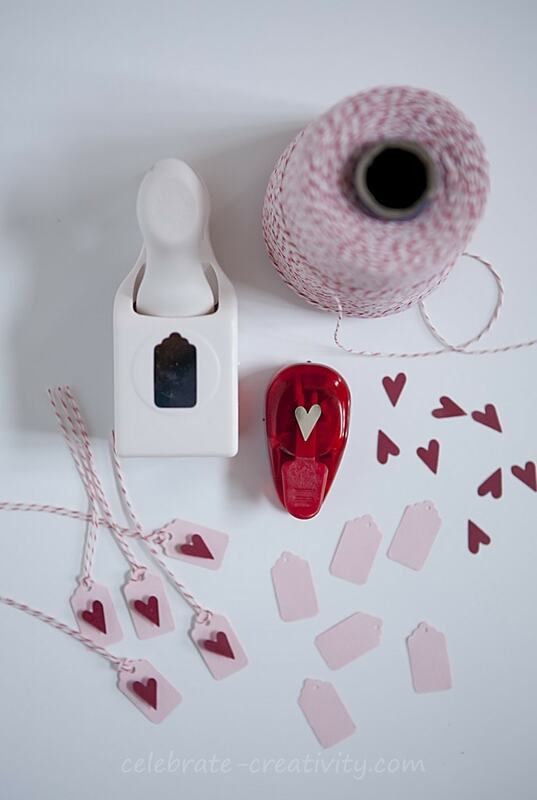 You can dress up your gifting with handcrafted tags using a few supplies including like a mini-tag stamp, a heart stamp, baker’s twine, some colored card stock and pretty ribbon. I used slender, pretzel stick goodie bags, which you can find at most crafts stores in the baking aisle. 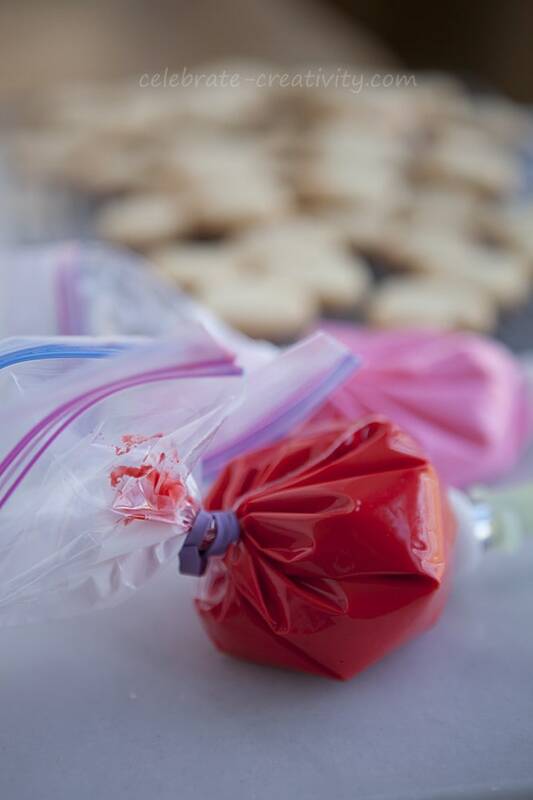 Insert cookies, use a twist tie to seal the bag and keep the cookies fresh. Add a pretty ribbon and your handcrafted tag… and you’ve got a lovely presentation. Now, how cute is this? I think gifted cookies taste so much better when they arrive in pretty packaging. Sweet offerings for the sweetest day of the year. Ahem, don’t forget to save a handful of these mini-bites to satisfy your own sweet-tooth. 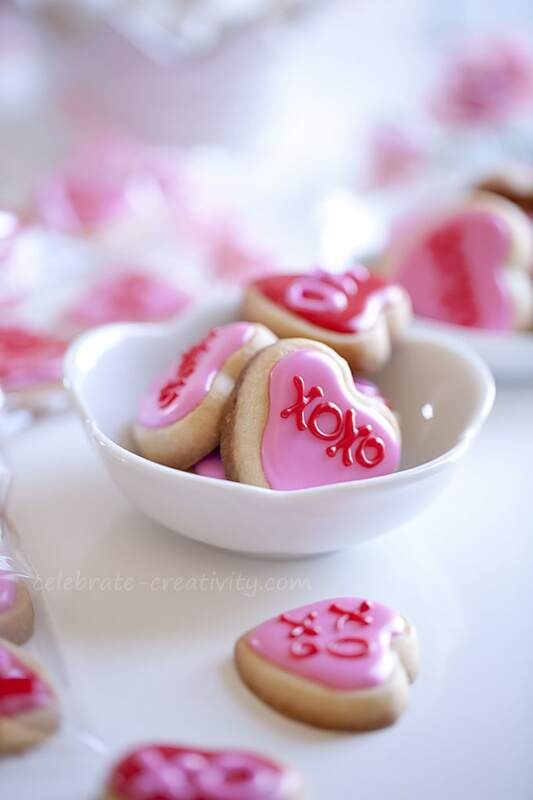 If you want to try your hand at some fancier cookies for Valentine’s treats, check out a few of my other sweet posts. Oh my goodness, these are so adorable! And I love how they are packaged, perfect to give to someone on Valentines day. Thanks for sharing Lisa! 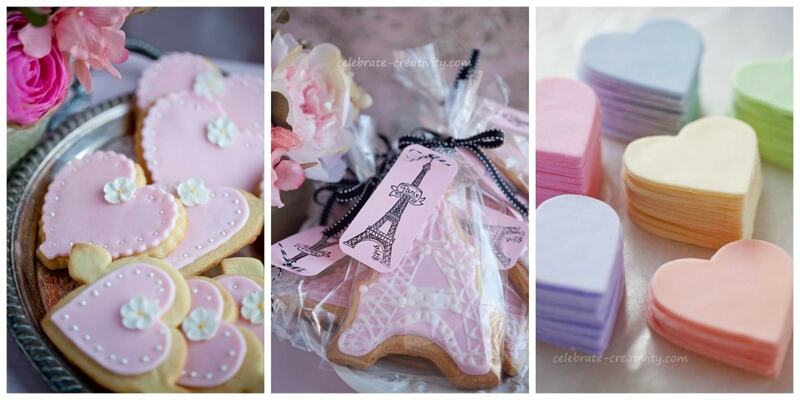 I wish my neighbors would gift some of these adorable Valentines Day cookies to me! Or…maybe I should be a nice neighbor and do the giving! Either way, I think I need some of these soon!